College can be bit stressful and confusing time for numerous students. From exams to papers and even college meetings make students to forget about the very crucial element – That Is Your Happiness! College is a time when you develop powerful and often life-long relationships that can impact your life in a positive or negative way. Choosing and feeding healthy relationships is a life skill that requires self-esteem, ability to work with others and effective communications. “Happy College Relationships” focuses on helping students to cope with the number of new people and new experiences they present in their first years of college. It interactively focuses on relationships with classmates, new roommates, new dating opportunities and testing new freedoms experienced with the removal of parental boundaries. EVALUATE the successful relationships they have had in the past and DUPLICATE those ingredients in their new relationships. DEFINE the ideal qualities that they want in their friends or partners and CONSTRUCT a blue print to utilize in future relationships. ANALYZE both the good and bad experiences in their lives and DESIGN plans to handle what the future has in store. DISCOVER your key strengths when it comes to making forever relationships in college. 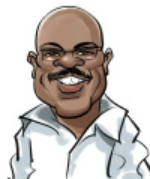 Herb draws on past experiences and storytelling and sharing practical tools so that students can live a happy and prosperous life despite of what your circumstances might be. The "Happy College Relationships" program also incorporates interactive exercises that allow participants to share their experiences. It is true that we all view this world differently from one another but Herb Ammons can guide you about communicating in the best manner. Herb Ammons brings a fresh approach through an inspiring take on life. 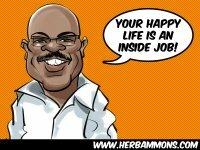 His message is simple: “Your Happy Life is an Inside Job.” It simply means you need to find it from deep inside your within and that will be the time to live college life at its best! 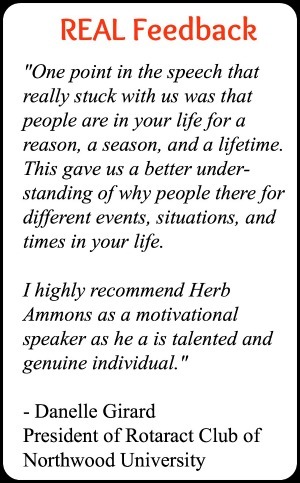 While there are many professional speakers available to universities, none of those speakers has the same approach to life as Herb. Speaking with students about dating and relationships can be a challenge for most speakers but not for Herb. His first marriage lasted only five years, his current marriage is almost 35 years. In his past keynote motivational speaking engagements, Ammons has proved himself to be the right choice for helping students in their quest to find that special somebody. He will guide you on how to be grateful or exhibit gratitude to feed relationships of life. His dating advice as a college Life Skills Speaker is second to none.